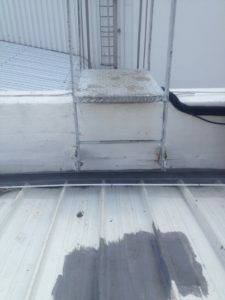 Whilst the main source of mechanical damage was covered in our September 2015 article titled Waterproof envelope or working platform, damage by maintenance personnel is common. This damage stems from how they gain access to the roof, an aspect frequently overlooked by architects and engineers. The most vulnerable areas are the headwall and sidewall flashings, together with the cladding immediately adjacent to these flashings, behind parapets and at stepped changes in level. Access ladders invariably terminate at the top of parapets, which can be between 300mm and 1.2m above the surface of the cladding. 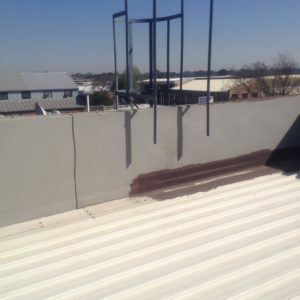 Unless the access point happens to coincide with a purlin the flashing and/or cladding have to absorb the impact of a worker jumping onto the roof, the force of which exceeds the 1.0kN concentrated design load specified in SANS 10160 Part-2 for inaccessible roofs. At the very least a platform, which can be as small as a stair tread, should be provided for a level difference up to 600mm and a ladder and platform where the difference exceeds 600mm. we also recommend the insertion of a styrene or suitably treated wood packer in the pan/s covered by the flashings when using broad-pan cladding profile.